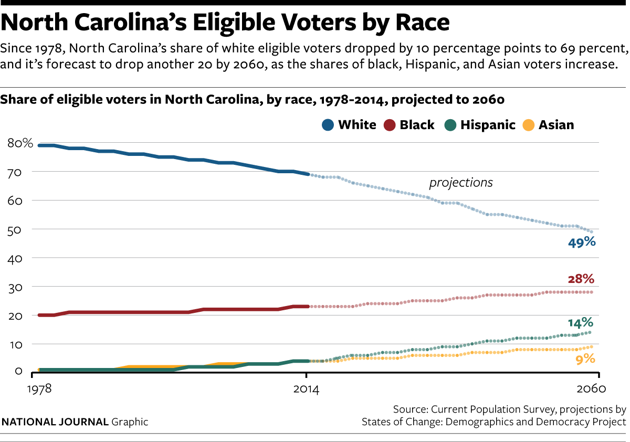 ANALYSIS: A look at the demographic changes that make North Carolina, Virginia, and Florida key to the outcome of the 2016 race. The emergence of three rapidly growing Sunbelt states as pivotal swing contests in presidential elections may be one of the most unexpected developments in recent American politics. From 1968 through 1992, the Republican presidential nominees won every contest in Virginia, North Carolina, and Florida except when Jimmy Carter carried the latter two in 1976. From 1968 through 1988, during the height of the Republican "lock" on the White House, the GOP presidential nominees averaged 54 percent of the vote in North Carolina, 56 percent in Virginia, and 58 percent in Florida. Even after Bill Clinton carried Florida in 1996 (aided by Ross Perot's third-party candidacy) and Al Gore and George W. Bush battled there in 2000 to their historic virtual dead heat, these states generally leaned solidly Republican. Clinton's Florida win in 1996 (a 48 percent plurality victory at that) was the Democratic Party's only breakthrough in any of the three states through 2004. As late as that 2004 election, Democratic nominee John Kerry did not attract more than 47.1 percent of the vote in any of the three. All three states loom as important battlegrounds once again in 2016. If Republicans can't hold North Carolina (with 15 Electoral College votes) and recapture at least Florida (with 29 EC votes), if not Virginia (with 13 EC votes) as well, they will likely face a very difficult path to an Electoral College majority. With this piece, Next America begins a series of articles--in cooperation with the States of Change: Demographics and Democracy Project--exploring the states likely to pick the next president. States of Change, a joint initiative of the American Enterprise Institute and the Center for American Progress in collaboration with demographer William Frey of the Brookings Institution, has assembled data on demographic change and voting behavior in the 50 states over the past several decades, and has built a demographic model to project future shifts in the states' population of eligible voters. In the weeks ahead, Next America will offer an exclusive first look at these findings. Next America will present and analyze the data for four groups of states that could play important roles in selecting the next president and shaping national elections for years to come: the battleground states of the Southeast, the Southwest, and the Rust Belt, as well as a group of other "reach" states that are solidly Republican today but whose growing diversity may make them competitive again, either in 2016 or after. The three new Southeastern swing states we are examining today differ in important ways. The underlying political dynamic today is probably most conducive to Democrats in Virginia, where they hold the governorship and both U.S. Senate seats (after fending off a surprisingly stiff challenge to Democrat Mark Warner in 2014). Republicans, though, hold a solid majority in the state House and a slim edge in the state Senate. Republicans have a much stronger hand in North Carolina, where they control the governorship, commanding majorities in both state legislative chambers, and last fall ousted first-term Democratic Sen. Kay Hagan, who was elected during Obama's 2008 breakthrough. Republicans now control both of North Carolina's U.S. Senate seats. In Florida, after Gov. Rick Scott's solid reelection last November, Republicans also control the governorship and big majorities in both state legislative chambers. Each party holds one of the state's U.S. Senate seats. Looking across all three states, Republicans control a clear majority of U.S. House seats--enough for a combined advantage of fully 2-to-1 (35-17). Florida and Virginia are both shaped heavily by immigration (they rank 4th and 15th, respectively, among states in their share of foreign-born residents). Virginia is more affluent than the two others: its median income ranks it at No. 8 among the states, compared to 39 for Florida and 40 for North Carolina. Over the past year, though, Florida and North Carolina have produced more-vibrant job growth: They trail only Texas and California in the number of new jobs created. All three states share two other common characteristics that are reordering their political landscapes, at least at the presidential level. One is dynamic population growth. From 2000 to 2013, North Carolina grew its population by 22.3 percent (which ranked it seventh among the states); Florida also grew by 22.3 percent (which placed it eighth); and Virginia by 16.7 percent (good enough for 15th). The other common experience in these three states is dramatic demographic change, particularly growing racial diversity, aging, and shifts in patterns of education and marital status. The shared political currents coursing through all three of these states include: the growth of a younger, nonwhite population that leans Democratic; a growing and preponderantly white senior population that is tilting more Republican; a blue-collar white population that is also leaning reliably red but universally shrinking in size; and a college-educated white population that is growing and more receptive to Democrats, though still leaning Republican overall. What follows is an exploration of those demographic and electoral dynamics, using the data and projections from the States of Change project. Virginia: Racial change in the state has been steady -- and profound. In 1980, whites represented 82 percent of Virginia's eligible voters and cast 86 percent of the state's actual ballots. By Obama's 2012 reelection, whites comprised only 70 percent of eligible and 74 percent of actual voters. Over that same period from 1980 through 2012 African-Americans increased their share of eligible voters only from 19 to 20 percent; their proportion of voters, reflecting improved turnout, rose more dramatically, from 14 to 19 percent. Hispanics, Asians, and mixed race voters were negligible in 1980; by 2012, they combined for 10 percent of eligible and 8 percent of actual voters. Since 1996, the Democratic presidential performance among Virginia whites has oscillated only in a narrow band from its high of 38 percent in 2008 to a low of 32 percent in 2004; Obama drew 37 percent in 2012. Sen. Mark Warner, who prides himself on his outreach to culturally-conservative whites, only matched that figure in his close call 2014 reelection. But in presidential races, the party has increased its vote share among blacks from the mid-80s around the turn of this century, to 91 and 93 percent under Obama, and has also gained ground among Hispanics (from about half against George W. Bush to two-thirds under Obama) and Asians (now also voting about 2-to-1 Democratic). Looking ahead, the States of Change model projects the minority share of eligible voters will reach 32 percent in 2016, 34 percent in 2020, and 43 percent by 2040. The African-American share is actually expected to stabilize at around 20 percent over that period, but the projections say the Hispanic share of eligible voters could hit 6 percent by 2020, while Asians and others could add another 7 percent. These changes are adding more complexity to the binary black-white politics that historically defined the state. North Carolina: As throughout the Sunbelt, the white share of the population has declined in North Carolina, though not as rapidly as in some other places. From 1980 through 2000, the white share of eligible voters fell from 79 to 74 percent; by 2012, it had dipped to 70 percent. African-Americans rose from 20 percent of eligible voters to 22 percent by 2000 and then 23 percent in 2012. Hispanics were almost nonexistent in 2000, but reached 4 percent of eligible voters by 2012. Asians, mixed race, and other adults now add another 4 percent. The change has been larger in the mix of actual voters. On that front, whites have fallen more steadily, from 82 percent in 1980 to 77 percent in 2000 to 69 percent in 2012. African-Americans, reflecting increased turnout, have jumped from 16 percent in 1980 to 26 percent in 2012; by then, Hispanics, Asians, and others contributed another 5 percent. Voting behavior among whites has varied relatively little over the past five presidential elections. According to the exit polls, Democratic white support peaked at 35 percent (in 2008), hit its nadir at 27 percent (with John Kerry in 2004), and reached 31 percent for Obama in 2012 (the same as Al Gore attracted in 2000). The party has improved its performance among African-Americans from around 90 percent under Clinton and Gore to fully 96 percent in 2012. In 2014, first-term Democratic Sen. Kay Hagan roughly equaled Obama's meager white showing, attracting just 33 percent of white voters en route to her defeat by Republican Thom Tillis. Looking forward, the model projects an accelerating rate of racial change in the voter pool. That reflects the youthful distribution of the state's minority population: nonwhites are now about two-fifths of North Carolina's young adults, compared to only about one-fourth of seniors. The model anticipates the white share of eligible voters dropping to 68 percent in 2016, 66 percent in 2020, and declining to 57 percent in 2040. It anticipates African-Americans continuing to grow, hitting 23 percent of eligible voters in 2016 and 26 percent by 2040. Hispanics show the greatest growth, reaching 5 percent in 2016 and double that by 2040; the model also projects Asians and others to nearly double from 4 percent in 2016 to 7 percent by 2040. 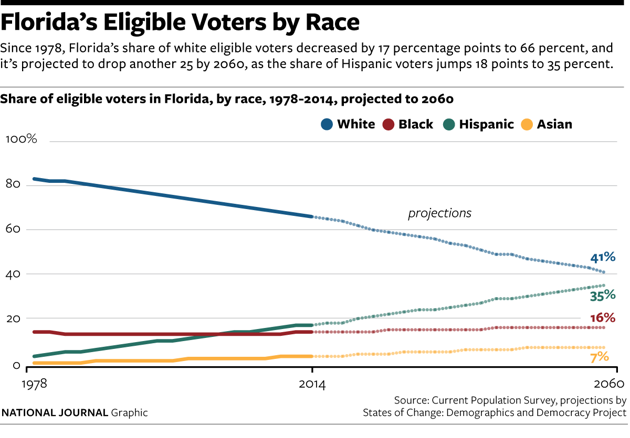 Florida: The white share of eligible voters has fallen even further here than in the other new Southeastern swing states, from 82 percent in 1980 to just 67 percent in 2012; the white share of the actual vote has fallen exactly as much over that period. African-Americans, with some fluctuations in between, have remained steady: they were 14 percent of eligible, and 13 percent of actual, voters in both 1980 and 2012. Asian-Americans and others were evident only in trace amounts in 1980; by 2012 they combined for 3 percent of the total. The big growth has come among Hispanics, who have jumped from 4 percent to 17 percent in their share of both eligible and actual voters from 1980 through 2012. This minority population growth has been essential to the Democrats' ability to contest the state because exit polls show their vote among Florida whites has declined fairly steadily from 43 percent in 1996, to around 40 percent in both 2000 and 2004, to 39 percent in Obama's first run and just 37 percent in his reelection. (Former Republican Gov. Charlie Crist, running as a Democrat, drew exactly that many en route to his 2014 defeat by Scott.) As elsewhere, the Democratic performance among African-Americans has swelled from 85 percent in Clinton's reelection to 95 percent in Obama's. The big change is the party's improving standing among Florida Hispanics; with better performance among younger Cubans and the state's growing number of non-Cuban Hispanics, particularly Puerto Ricans, exit polls say Democrats have increased their share of the statewide Hispanic vote from about two-fifths under Clinton to fully three-fifths in 2012. Looking forward, the model sees the white share of eligible voters dropping more profoundly here than elsewhere in the Southeast -- down to 64 percent in 2016, 62 percent in 2020, and only 51 percent in 2040. (It forecasts continued decline to just 41 percent by 2060.) While African-Americans will remain largely stable at just under one in six eligible voters, the model forecasts Hispanics reaching 18 percent by 2016, 20 percent by 2020, and more than one-third by 2060. Asians, mixed race, and others also keep growing, too, though in more-modest amounts: The model places them at 4 percent by 2020. Virginia: As in many states, whites without a college degree are the most Republican-leaning component of the electorate: in 2012, the exit poll found that Obama carried just 24 percent of Virginia white men without at least a four-year college degree and only 30 percent of noncollege white women; he didn't perform much better in 2008. But from 1980 through 2012, noncollege white men have dropped from 29 to 19 percent of voters. Noncollege white women have comparably declined from 32 to 22 percent of voters. 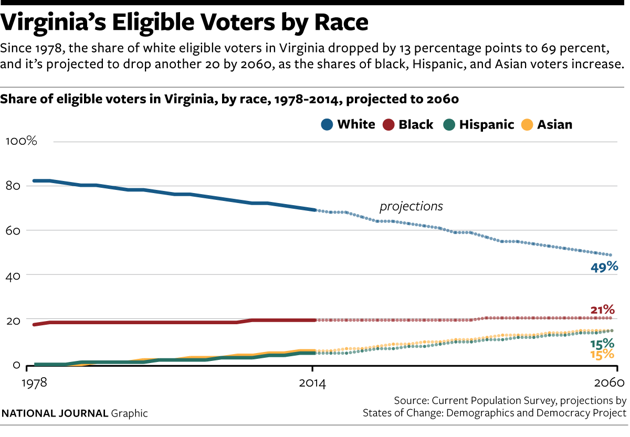 In 1980 noncollege whites were nearly two-thirds of eligible Virginia voters and three-fifths of actual voters; by 2012, they were only 45 percent of eligible voters and only about two-fifths of actual voters. Over these three decades, the state's white electorate has tilted toward college-educated voters, who have proven somewhat more receptive to Democrats, especially the women. From 1980 through 2012, college-educated white men bumped up from 9 to 12 percent of Virginia's eligible voters and from 14 to 16 percent of its actual voters; Obama carried almost exactly two-fifths of them in each of his campaigns, exit polls found. More dramatically, college-educated white women jumped from only 7 percent of eligible voters in 1980 to 13 percent in 2012, and from 10 to 17 percent of actual voters. These women, many of them socially liberal, are the segment of the white electorate in Virginia most open to Democrats: the party has carried from 46-48 percent of them in the two Obama campaigns. As of 2014, college white women and minorities combined for 45 percent of the state's eligible voters -- up from only one-fourth in 1980. North Carolina: As recently as 1980, whites without a college degree accounted for two-thirds of all eligible voters and almost that large a share of actual voters. In the state, these voters have consistently displayed an overwhelming preference for Republican presidential candidates. Since 1996, no Democrat has carried more than the 31 percent among noncollege white men that Obama attracted in 2008 (he fell to 25 percent in 2012), or more than the 35 percent among noncollege white women that Bill Clinton won in 1996. (Obama in 2012 carried just 24 percent of them.) In 2014, Hagan won just one-fourth of noncollege whites. But these voters are contracting in numbers: In 2012, they constituted just under half of eligible (49 percent) and actual (43 percent) voters. College-educated white men are growing (from 9 percent of actual voters in 1980 to 12 percent in 2012), but they haven't proven much more receptive to Democrats: no party presidential nominee since 1996 has won more than the 36 percent of them Obama took in 2012. College-educated white women are growing somewhat faster -- their share of voters rose from 9 percent in 1980 to 14 percent in 2012, and Democrats have made more inroads with them. But they haven't proven as receptive to Democrats as their counterparts elsewhere: Clinton won 44 percent of them here in 1996, but no Democrat since has matched that (Obama took 42 percent each time). Florida: As a state whose political tradition includes more-Northern influences, Florida hasn't seen as overwhelming a stampede toward the GOP among working-class whites as North Carolina has. Since 1996, the Democratic presidential nominees have carried between 36 and 46 percent of noncollege Florida white women; Obama took exactly two-fifths in 2012. Noncollege white men oscillated in their Democratic vote only between 37 and 40 percent from 1996 through 2008 before skidding to just 31 percent for Obama in 2012. But as elsewhere, these voters are shrinking as a share of the electorate: They were two-thirds of Florida's actual voters in 1980 but only about two-fifths by 2012. Over that same period, college-educated white men have increased from 9 to 12 percent of voters, and college-educated white women from 7 to 13 percent. But Democrats haven't benefited as much from that trend as they have in many other states, because they aren't winning as many of those voters here. In particular, their performance among college-educated white women -- which has run at 45, 43, 43, and 42 percent in the past four elections -- lags their national showing with that group. In 2014, Crist drew only about one-third of both college and noncollege Florida whites. Virginia: On a national basis, Democrats run better with single voters, especially single women, and Republicans run best among married voters. In 1980, singles represented 33 percent of eligible voters in Virginia; that number jumped to 44 percent by 2012. Married voters were two-thirds of the eligible pool in 1980 and 56 percent by 2012. State-level exit poll data on the voting behavior of single and married adults were not available. North Carolina: As in other states, the shift in marital status represents one of the most profound social changes over the past generation. In 1980, married couples represented 70 percent of eligible voters and 77 percent of actual voters; by 2012, those numbers had tumbled to 54 percent and 59 percent, respectively. Over the same period, single men increased from 9 to 16 percent of the actual voters, and unmarried women jumped even more, from 14 to 26 percent of voters. State-level exit poll data on married and single voting patterns were unavailable. Florida: The story is similar here. Married voters cast 70 percent of Florida's ballots in 1980 and 57 percent of them in 2012. Over that period, single men doubled their share of voters from 9 to 18 percent, and single women edged up from 21 to 25 percent. State-level figures on their voting performances were not available. 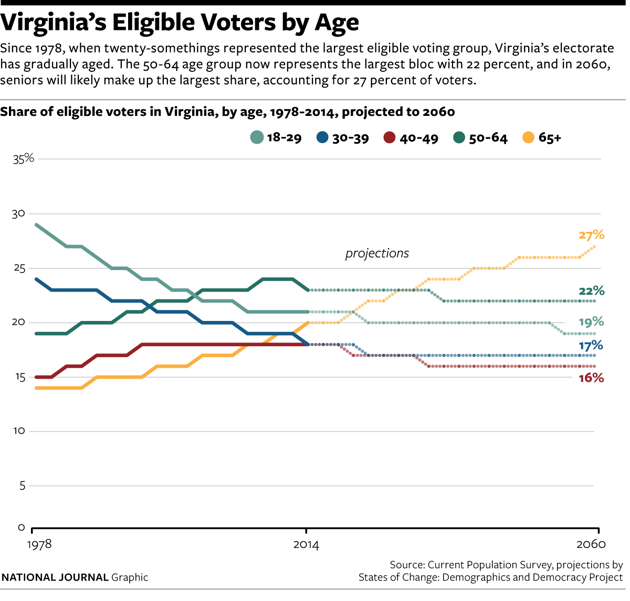 Virginia: The Virginia population is aging at a time when Democrats are also faltering among older whites. In 1980, voters under 40 represented a 51 percent majority of Virginia eligible voters; by 2012, their share had fallen to 40 percent. Voters 50 and older now account for slightly more of the state's eligible voters (43 percent), and the exit polls showed that Obama in 2012 carried only 27 percent of whites ages 45-64 and 38 percent of white seniors in the state. Almost exactly four-fifths of Virginia's seniors today are white, as is 70 percent of its 50-64 population. 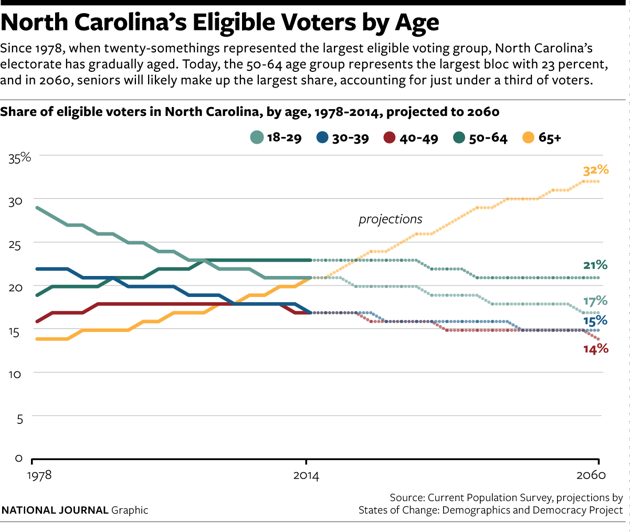 Looking forward, the model expects the age mix of the state's population to stabilize -- though with a decidedly gray tint. The model projects young adults 18-29 to remain around 20 percent of the population, while the share of those 50 and older rises from 43 percent in the next two elections to 47 percent by 2040. The model projects that older population will remain preponderantly white for decades, even as diversity transforms Virginia's younger generations. Already as of 2014, minorities represent 38 percent of the eligible 18-29-year-old population, but only 29 percent of eligibles ages 50-64 and just one-fourth of eligible seniors. By 2040, the model anticipates that minorities will reach half of the 18-29 eligible population, but remain only about two-fifths of the 50-64 eligible group and only about one-third of eligible seniors. A key question for Democrats, here as in other aging states, is how the future waves of retirees will affect the political leanings of seniors. Today's elderly population is dominated by the very conservative Silent Generation seniors, leavened by some early baby boomers, who lean relatively more toward the left. In the next few years, those early baby boomers will comprise a growing share of the overall elderly population, potentially moderating the big GOP advantages with white seniors now evident in almost all states. But after 2020, the senior population will receive an influx of younger baby boomers and then the older elements of Generation X, which have generally leaned more conservative in their voting behavior. The pendulum could swing again around 2040 when the last elements of Generation X, and then the first portions of the Millennial Generation, each of which have proven more receptive to Democrats, move into retirement. North Carolina: The state's age trajectory somewhat belies its image as a youth-oriented place. Young adults ages 18-29 have fallen as a share of eligible voters from 28 percent in 1980 to 21 percent in 2012; adults ages 30-39 have slipped somewhat, too, from 22 to 18 percent. Those ages 40-49 have remained steady at 17 percent, but the big increase, as elsewhere, has come in the over-50 population: those residents represented 34 percent of eligible voters in 1980 and 43 percent in 2012. In 2012, they cast a 51 percent majority of all votes. The projection model shows the 18-29 population stabilizing through 2040 at around one-fifth of eligible voters, and adults 30-39 dipping slightly to about one-sixth. The model shows voters 50 and older slowly rising from their 43 percent in 2012 to 45 percent in 2016 and ultimately half by 2040. The state's politics in the years ahead may be shaped less by the distribution of its youth and elderly population than by the contrast between them. North Carolina is facing an enormous "cultural generational gap," as demographer William Frey has termed it. While minorities today represent about two-fifths of the 18-29 population, they constitute only one-fourth of seniors. The model projects minorities will reach 45 percent of the young-adult population by 2028. But the model does not forecast minorities reaching even two-fifths of the senior population until 2044. Florida: Fulfilling its popular image, Florida's electorate is indeed older than the other Southeastern swing states. That's an intensifying challenge for Democrats, whose share of the senior vote in the state has declined steadily from Clinton's 55 percent in 1996 to 40 and 41 percent in Obama's two races. (In 2014, Crist also carried just 41 percent of Florida seniors.) Here Democrats face not only the problems with older whites plaguing them elsewhere but also an older Cuban generation that is more conservative than its younger counterparts. In 1980, the state split about evenly between eligible voters under 40 (44 percent) and over 50 (42 percent). Even then, though, the older cohort accounted for more than half of all actual voters, compared to just one-third for the younger. By 2012, voters under 40 had fallen to just over one-third of eligible voters and about one-fourth of actual voters. Those over 50 meanwhile grew to nearly half of eligible voters and ticked up to 56 percent of actual voters. Looking forward, the model projects that voters under 40 will remain about one-third of eligible voters through 2020, while seniors will edge up to reach fully half. By 2040, it anticipates the gaps between the two groups growing even slightly wider. As throughout the Sunbelt, a major factor in Florida's politics is likely to be the "cultural generation gap" between its youth and elderly population. Today, 44 percent of Florida's eligible 18-29-year-old voters are nonwhite, almost double the minority share among seniors (23 percent). 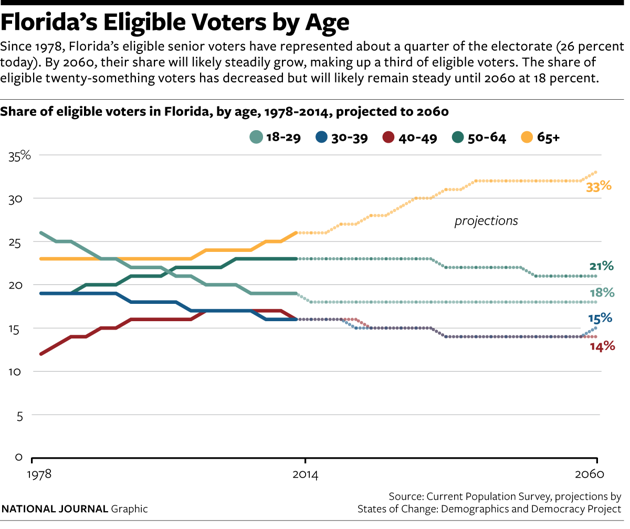 The model projects the minority share of eligible young Florida voters to hit 50 percent by 2020 and cross three-fifths by 2040; but even by then, it forecasts that minorities will comprise only just over one-third of the state's eligible seniors. In all these states, bridging that divide between the "brown and the gray" -- a youthful generation being reshaped by diversity and a growing senior population whose complexion is changing much more slowly -- looms as a fundamental challenge.